Serrano Systems provides a wealth of experience in communication systems, hardware and software design. Communication Protocols: Bluetooth, CDMA, PHS, DECT, 802.11, GSM/GPRS, Satellite Communication. Hardware: VHDL and Verilog for CMOS integrated circuits and FPGAs. 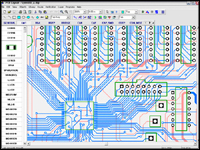 Board-level design and IC design. Software: C, C++ and assembly language on a variety of platforms. Object-oriented, UML and Structured Design methodologies. CPU Architectures: ARM, Intel, Hitachi, Motorola, SPARC.